From cell towers cometh rainfall estimates? As the number of stations declines, our estimates of how much rain fell in a given area at a given time gets worse and worse, and this can create really bad problems for applied social scientists. Rainfall and temperature typically show up as independent variables in social scientists' statistical analyses. If these variables are measured with error and this error is "classical", i.e. uncorrelated with the "true" underlying thing being measured, then your estimates of the effect of these variables on the outcome of interest get biased towards zero. That is, you (perhaps erroneously) conclude that rainfall or temperature had no effect -- or a much smaller effect -- on crop yields or infant mortality or conflict than what actually occurred. There are some work-arounds to having limited gauge data. One is to use "reanalysis" data, in which some kind climate scientists sitting in a basement somewhere take the available observations and use them as inputs to a climate model, spitting out a physically consistent record of weather over time. Another option is to use data from satellites, but satellites appear to measure rainfall better than temperature, and the available satellite output is often at a fairly coarse scale (e.g. 200km grids). A third is to use interpolations of the gridded data, which imputes missing observations using a weighted average of nearby observations. This works well when there are nearby observations, but the station density is so low in places like Africa that interpolation might introduce substantial error. Accurate and timely surface precipitation measurements are crucial for water resources management, agriculture, weather prediction, climate research, as well as ground validation of satellite-based precipitation estimates. 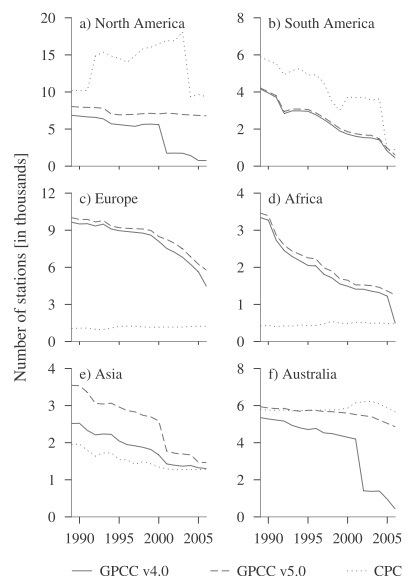 However, the majority of the land surface of the earth lacks such data, and in many parts of the world the density of surface precipitation gauging networks is even rapidly declining. This development can potentially be counteracted by using received signal level data from the enormous number of microwave links used worldwide in commercial cellular communication networks. Along such links, radio signals propagate from a transmitting antenna at one base station to a receiving antenna at another base station. Rain-induced attenuation and, subsequently, path-averaged rainfall intensity can be retrieved from the signal’s attenuation between transmitter and receiver. 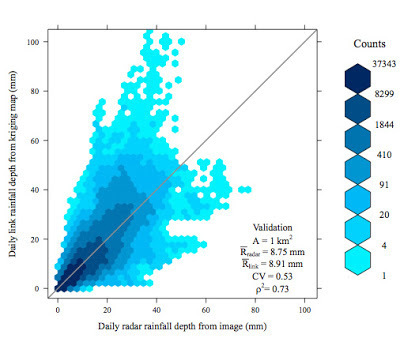 Here, we show how one such a network can be used to retrieve the space–time dynamics of rainfall for an entire country (The Netherlands, ∼35,500 km2), based on an unprecedented number of links (∼2,400) and a rainfall retrieval algorithm that can be applied in real time. This demonstrates the potential of such networks for real-time rainfall monitoring, in particular in those parts of the world where networks of dedicated ground-based rainfall sensors are often virtually absent. This seems potentially really cool, particularly for places like Africa where the cell network is expanding incredibly fast. Here's a plot of how they did in the Netherlands, comparing their cell-tower derived estimates (y-axis) to what you get off radar (x-axis). I'm not sure why they didn't compare against rainfall gauge estimates (have the Dutch stopped operating their rainfall stations too? ), but nevertheless this doesn't look too bad. 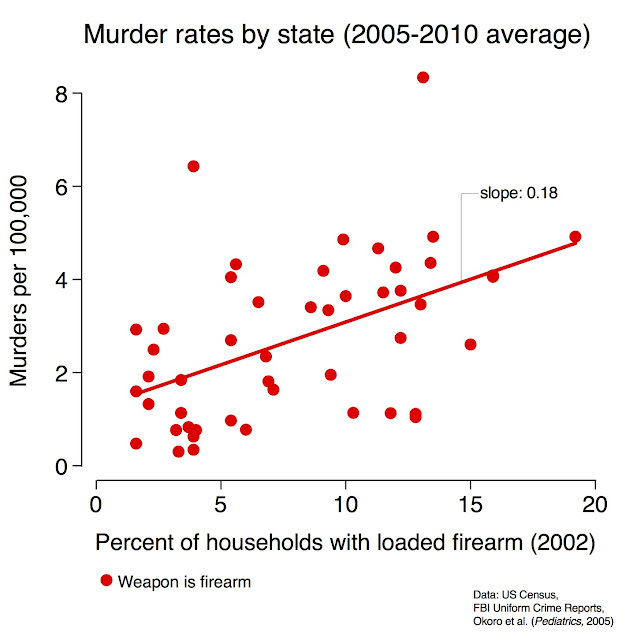 Really small average difference between the two measurements, and a high correlation. It's pretty much impossible to generate a similar plot over a region of interest in, say, Africa, comparing what you get from interpolated station data or satellite data to what the "true" observation is on the ground, but I would be surprised if it looks this good. The authors do note that cell phone towers in the tropics tend to operate at a lower frequency, which "can increase errors in rainfall estimates due to the increased nonlinearity of the relationship between rainfall intensity and specific attenuation at lower frequencies". But given the low baseline number of weather stations in much of the tropics, and the fact that the number of stations is getting even smaller, it seems like this sort of tool might have a lot of potential. Hopefully, as the authors say, "this research report will contribute to persuade cellular communication companies worldwide to provide received signal level (RSL) data from their radio link networks free of charge for both research purposes and other applications of societal relevance." It would be really neat if they could show how this works in some place with slightly sparser cell coverage. Oh, and it would be nice if they could get us temperature too. 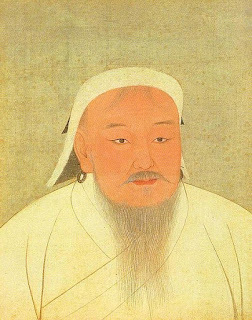 Hot to trot: does Genghis Khan owe it all to climate change? There is now a voluminous literature seeking to understand links between climate and various types of human conflict. So far this literature has been a lot better at describing the "reduced form" relationship between climate and conflict -- the statistical effect of a changes in a given climate variable on a given conflict outcome -- than in understanding the underlying mechanism(s) that link climate variables to conflict events. There are many such mechanisms that have been proposed. 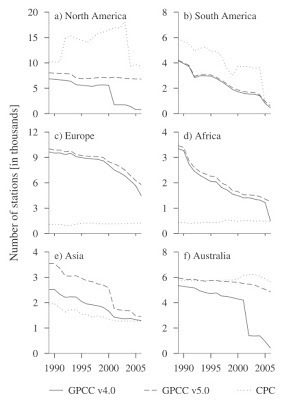 To stylize the debate somewhat, economists' favorite explanation has to do with opportunity costs: an individual becomes more likely to start or join a conflict if a change in climate harms his alternate modes of income generation, such as farming. Political scientists often favor explanations about state capacity: an adverse shift in climate can reduce government revenues (e.g. through reduced tax revenue or export earnings from agricultural commodities), and thus weaken the government's ability to repress insurgents. Psychologists often focus on aggression: for whatever reason, hotter temperatures cause humans to respond more aggressively and violently to one another. A fourth potential mechanism concerns direct climatic effects on the logistics of war: it's hard to wage war if your cavalry is stuck in the mud, if floods wash out all the roads and bridges, or if your troops are freezing. This mechanism is echoed by noted war-mongerer Frederick the Great, who apparently said that "It is always necessary to shape operation plans... on estimates of the weather". The logistics mechanism has also been the focus of some recent research that has received significant coverage in high-visibility outlets (see here, here, and here) - somewhat remarkable because, as far as I can tell, these researchers have yet to produce any sort of publication or working paper on the topic! What this group of researchers has apparently done is to use tree rings to reconstruct a long-run record of climate in Mongolia, with a focus on the climate around the emergence of Genghis Khan in the 13th century. They show that Khan's rise to power around 1206 correlated with two decades in the climate record that were wetter than any other 20-year stretch over the previous 900 years. Mongolia is typically quite dry, so this wetness was likely a boon to fodder production, which in turn would have improved Khan's meat supply and (particularly) his ability to feed the horses that he and his hordes depended on for transportation. And this, in turn, would have allowed Khan to exercise his charming habit of "wholesale massacres of civilian populations" and would have abetted his remarkably rapid establishment of the largest contiguous land empire in the history of the world. All of this would seem to make G. Khan one of history's premier climate change beneficiaries. What does this tell us about the logistics hypothesis that links climate to conflict? First, aside from testing this specific mechanism, hopefully the authors will use their long time series to perform a rigorous statistical test of how variation in the strength of the Mongol Empire was linked to variation in climate. As mentioned previously, these sorts of rigorous tests are largely absent in the paleo literature on climate and conflict, making you worried that changes in climate could be correlated with other time-trending variables that also affect conflict. Then the trick to establishing support for the logistics hypothesis would be to try to shut down other potential explanations for what's going on. This is generally really hard to do empirically, as you almost never have data on all the intervening variables of interest, and as it is often the case that the variables you do have all happen to respond to climate. (For instance, distinguishing between "state capacity" and "opportunity cost" arguments is pretty thorny, because both individual incomes and government revenues respond to changes in climate in a measurable way). So promoting the "logistics" hypothesis here will probably boil down to good 'ol storytelling. But in this particular case, this story might have legs. It's hard to see how climatic conditions that created more favorable economic conditions would lower the opportunity cost of joining a rebellion or reduce state capacity. The argument here is the opposite: climatic change momenta enriched the state and its capabilities. A bigger worry is that rainfall and temperature appear positively correlated in this setting -- these guys note that it was relatively warm during the same period -- and so more rainfall could just be proxying for higher temperatures, and these could have had a direct effect on Mongol aggression. But you would have to REALLY be pissed off by higher temperatures to repeatedly go on a pan-continental killing spree, so this also seems a little unlikely. The big question at the end of the day is probably more about whether climate's effects on 13th century conflict logistics has any implication for today's world, and today's climate/conflict debates. Hopefully the researchers will be as adept at answering this question as they have been in generating pre-publication press coverage!